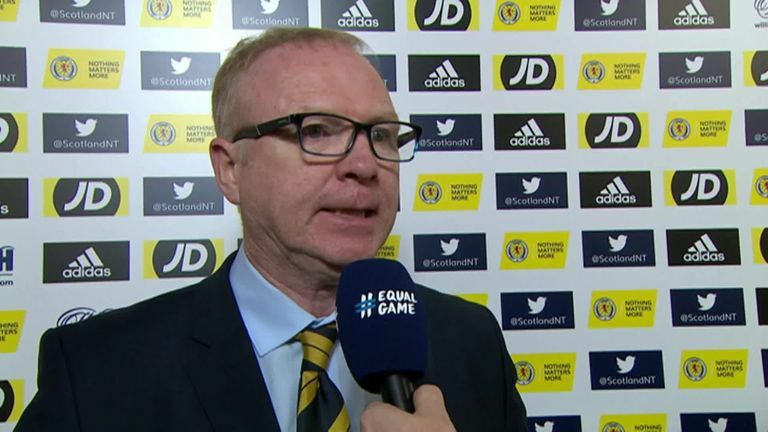 Alex McLeish has urged Scotland to cut out "stupid mistakes" after their 3-1 friendly defeat to Portugal on Sunday. Having lost 2-1 to Israel in the UEFA Nations League on Thursday, Scotland were unable to bounce back with a positive result as they were beaten at Hampden Park. Scotland showed some encouraging signs early in the game but otherwise rarely threatened and only scored a late consolation goal through Steven Naismith. McLeish said: "I thought it was a good performance. I didn't believe we deserved to be 3-0 down. We lost stupid goals again and the lads wanted to see the videos and we showed them and they owned up to some individual errors. Individual errors at this level can be devastating. "They have to learn, but you can't make too many mistakes if you want to be a regular international. You can't make as many mistakes as we have done in recent games and that is probably the main thing we have to sort out." Scotland face a couple of crucial Nations League games in November as they travel to Albania on November 17 and then host Israel on November 20. McLeish is keen for his side to "show resilience" and bounce back from their recent setbacks. "If we are going to be a top international team we have to get clean sheets. That's the key," he said. "If you watch the game [against Portugal] I thought we played very well. But for the daft goals it's hard to fault the way we played. We played to a good plan."